To offset all of the girly craftiness that surrounds me, I have to have some manly hobbies. One of them is my car hobby: I buy and sell cars regularly. I'm technically a part-time used car salesman, but without the tweed jacket (I do have a corduroy jacket, if that counts). I typically will drive a car for one to three months and then sell it, making money half of the time and taking a hit the other half. 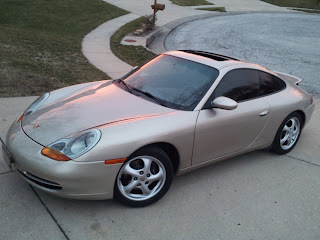 To see what I'm driving now and what's been in my garage, check out my other blog, Monthly Test Drive. Wow cool cars, how much room does the coop have? Is it as small as it looks? Found your blog on Little Miss Momma. Too funny! Great idea for a blog. Um, AWESOME! My husband wants that Porsche, and I want that cooper mini. Really-those are on our list as our next cars-we even have a porsche fund going. What'd you think? Or...is that somewhere in the archives already? Nice to meet you!